Go go Dragon! SpaceX just posted video of its prototype Dragon 2 spacecraft testing its ability to hover. Once certified, this spacecraft will carry astronauts to the space station as part of NASA’s commercial crew program. Flights are tentatively planned to start in 2017. The Dragon 2 (or Crew Dragon) is the spacecraft that will sit atop the Falcon 9 rockets. Although it’ll be launched into orbit by the rocket, the eight SuperDraco engines will be used to bring the craft down for a controlled landing when it brings crews safely home. The hover test was the latest in a long line of tests for certifying the Dragon 2 to transport humans. The craft performed beautifully during two tethered tests in November 2015 at SpaceX’s test facility in McGregor, Texas. A NASA statement describing the eight thrusters as landing the full-sized spacecraft mockup with the “accuracy of a helicopter”. 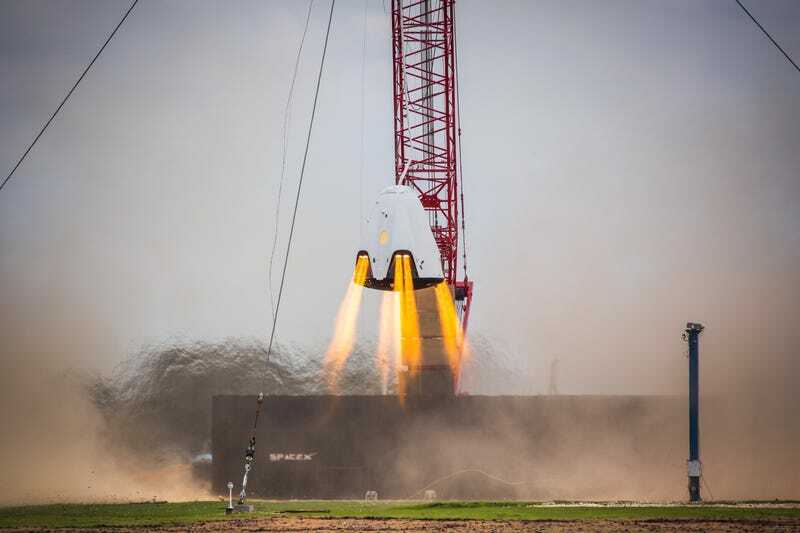 Despite the flawless performance, the thrusters won’t be used the first few times humans ride in the Dragon. Initially, the spacecraft will use parachutes to slow its descent through the atmosphere, and splash down in the ocean in a manner familiar to fans of the Apollo missions.